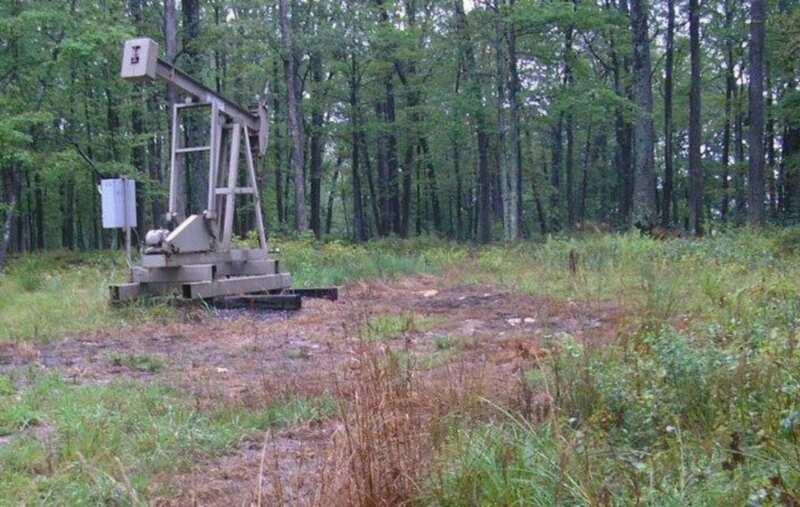 STATE IMPACT PENNSYLVANIA – Spreading oil and gas wastewater has been a common and cheap way for municipalities to suppress dust on unpaved roads in parts of Pennsylvania for years. But a new study found the practice — which the state recently ended — could threaten environmental and public health by leaching metals, salts, and radioactive materials into surface or groundwater, nearby soil, and even the air. State law prohibits using brine from Marcellus shale gas wells. But for years, waste from shallow, conventional wells was allowed, even though it contains many of the same contaminants as that from deeper shale wells. The study found there were “no universal standards” for radioactivity or other components in wastewater used on roads, and that while Pennsylvania did test the brine for some contaminants, “radium concentrations were never reported” by the state. The Department of Environmental Protection, which for years allowed municipalities to treat their roads with brine, said last week it was ending the practice, after it was sued by a Warren County resident. Before the decision, over a dozen counties in Western Pennsylvania used oil and gas wastewater on roads, and at least 13 other states — including Ohio, Michigan, West Virginia and New York — allowed the practice, according to the Penn State study. But it was especially common in northwestern Pennsylvania. In 2016, municipalities spread more than 11 million gallons of brine on roads in Pennsylvania, 96 percent of it in northwest part of the state. That represented 6 percent of the Pennsylvania conventional oil and gas industry’s wastewater. 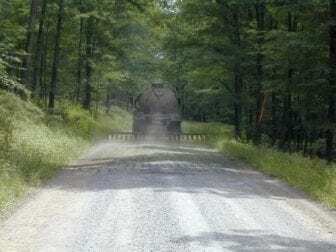 Spreading oil and gas wastewater has been a common and cheap way for municipalities to suppress dust on unpaved roads in parts of Pennsylvania for years. Unpaved roads are large sources of dust in the U.S., which can contribute to heart and lung disease. Photo: Center for Dirt and Gravel Road Studies. What to do with brine from fracking and oil and gas production has been a subject of concern for regulators since the gas boom began a decade ago. The water contains metals and salts from the formations where oil and gas deposits lay, as well as fracking chemicals. In 2011, Pennsylvania asked treatment plants not to handle waste water from the Marcellus shale, or unconventional gas industry. And in 2016, the EPA banned the process. Today, the Marcellus industry recycles much of its wastewater, and sends much of what it doesn’t to industrial wastewater treatment plants or to underground injection wells. But the state’s conventional oil and gas industry has been exempt from some of the stricter rules imposed on Marcellus shale producers. A Duke study recently found treatment plants that handle conventional oil and gas wastewater facilities are causing a buildup of radioactive materials at the bottom of three Western Pennsylvania rivers and streams. William Burgos and Nathaniel Warner, two Penn State scientists, became interested in the practice while poring over a Pennsylvania DEP database, which showed where different gas companies sent their wastewater. Some went to treatment plants, some to underground injection wells. “There was also a category that showed up as ‘road spreading,’” said Burgos, a professor of civil and environmental engineering. He and Werner wanted to find out more about what happens when oil and gas brine is used on roads. They collected brine from 14 townships in northwestern Pennsylvania, and simulated spreading it on a dirt or gravel road in a lab. In a paper published this week in the journal Environmental Science & Technology, they found that radium and lead from the brine washed off the road material after exposure to simulated rainstorms. “Some of the radium and some of the lead sticks to the road. But a lot of it just sort of leaches out with any any rain event. So where that goes we don’t we don’t really know,” said Warner, an assistant professor of civil and environmental engineering at Penn State. They also found that the contaminants in the brine could be drying up and getting into the air, presenting a hazard for people who live nearby. In 2015, townships in northwestern Pennsylvania spread an average of 74,000 gallons of O&G wastewater on their roads, equivalent to saving approximately $70,000 dollars per township, the study found. The authors found that between 2008 and 2014, the use of oil and gas wastewater, or brine, on Pennsylvania roads released four times the amount of radium into Pennsylvania’s environment than specialized treatment plants that handle brine, and 200 times the amount released from inadvertent spills. In 2017, a Warren County woman sued the DEP for allowing road spreading of brine in her township, saying it caused air and water pollution. Last week, the DEP essentially agreed with the plaintiff’s argument that the agency did not have legal authority to issue road-spreading permits for oil and gas wastewater under state law and suspended its permitting of the practice. Most of the state’s 25,000 miles of unpaved roads are maintained by municipalities, often small ones with relatively tiny road budgets. 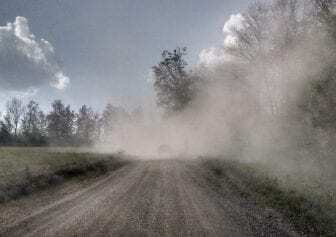 And keeping dust to a minimum can be a large priority for people who live near unpaved roads. Chase said that brine spreading is common in northwestern Pennsylvania, a hub of conventional oil and gas development, because the brine is often free or low-cost for municipalities to use. While brine spreading could release contaminants to nearby groundwater and streams, dust from unpaved roads can contribute to heart and lung disease, Burgos says. Nicole Fahrenfeld, assistant professor of civil and environmental engineering at Rutgers, said the study raises questions about using oil and gas waste on roads. At a minimum, she says, regulators should test whether the practice is causing water quality problems near treated roads. Avner Vengosh, a Duke professor Professor of Earth and Ocean Sciences, said the study’s lessons are clear.